Hello friends, Today I am sharing my very requested ‘Everyday Makeup Routine’. Makeup is something I absolutely love, and actually my drive behind Living Life Pretty. 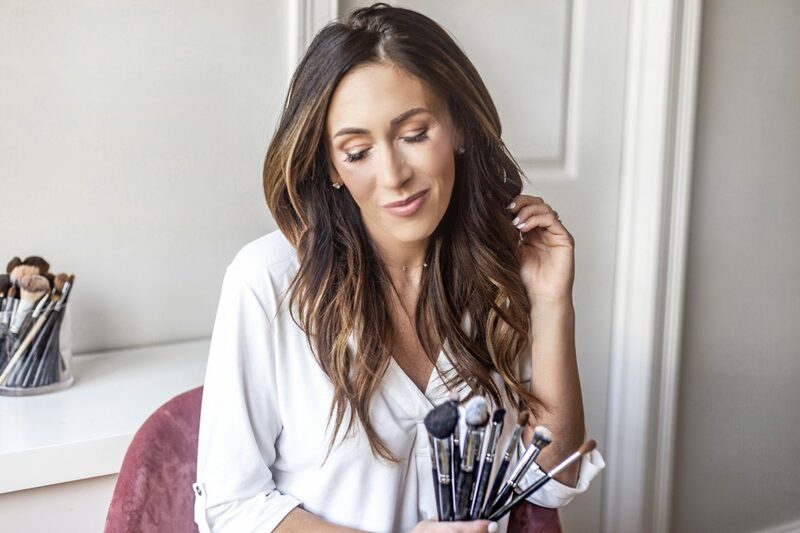 I am excited to share what products I use, my favorite brushes, and some tips & tricks I have learned along the way! Hope everyone is having a wonderful week so far. Can you believe its already April? Since I am personally a visual learner, I have included a full video below. For the record, I am by no means great at creating videos…I actually stink! However, I found it easier to explain step to step. Below I will be talking about the order in which I apply makeup, my tried and true products, and what brushes I use for my everyday makeup routine. First, I want to start off by saying…..no matter what, wash your makeup off each night – your face will thank you! Second, use a primer if you’re wearing makeup for any length of time. It helps with application and longevity. My favorite ones are the Becca Lighting face primer, and the Smashbox photo finish. Foundation – Depending on what I have going on that day is how I decide which one to use. On errand days and running around I use my favorite drugstore – Loreal Pro Glow. When I am taking blog pics, or have something important to attend I use the Milk Blur foundation. I love to mix foundations and talk about it in the video below. Concealing my under eyes is a must. I started of the the Nyx contour stick for brightening. After I will top is off with concealer. I use the Tarte Shape tape. I didn’t use it in the video since I had just ran out. Next, I contour my face using the other end of the Nyx Contour stick in medium. It’s super blendable and is a great color that isn’t to orange or muddy. I then start on my eyes. I do an easy 3 colors to achieve my look. My top three palettes are; Modern Renaissance, Urban Decay Naked 3, and Kat Von D shade and light. Since I have Eyelash Extensions I don’t need to apply mascara. I can go on for days about how much I love my extensions. If you need a great mascara though, this Tarte one is my favorite. I still use it on my bottom lashes. I had my eyebrows micro-bladed. However, my favorite brow products are the Anastasis DipBrow and the Benefit Goof Proof Brow pencil. On to the checks! I always reach for my Charlotte Tilbury Cheek to Chic blush. This palette has two colors that you can mix to achieve your favorite shade. If you have followed me for any length of time…. you know my love for the Stila Liquid Lipsticks. It literally lasts all day. My favorite shades are Firenza, Patina, and Baci. If you are want to get your makeup to last all day, the Urban Decay All Nighter Spray has been a staple of mine forever. What tools & brushes do I use to achieve these looks? I use a variety of different brushes, at different price points. You don’t need to spend alot to get great brushes. Some of my favorite affordable brush lines at Morphe and EcoTools , Real Techniques. I also love my Sigma brushes. They wash great and stand up to the test of time. There you have it girls! Hope my Everyday Makeup Routine Video wasn’t to painful to watch… HAHA. Goal for this summer – work on my video skills. I hope you learned something or maybe find a new product to try out. If you have made it to the end, Thank you! I know this was a long one. Happy Week My Sweet Friends!